Organisation: All players dribble in the same area with triangles set up (how many depend on numbers of group. Players in triangle do not have a ball, players on outside starts with a ball. Players dribble around area looking to pass in triangle. Once a pass has been made the passing player switches with the player inside. 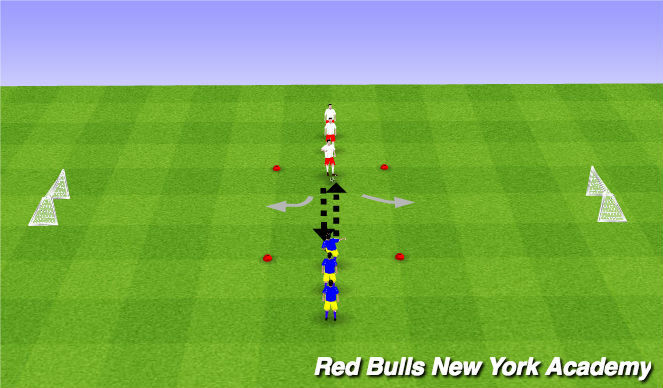 The player in the middle must receive through one side of the triangle and go out another side, players cannot go out the same side they received the ball. 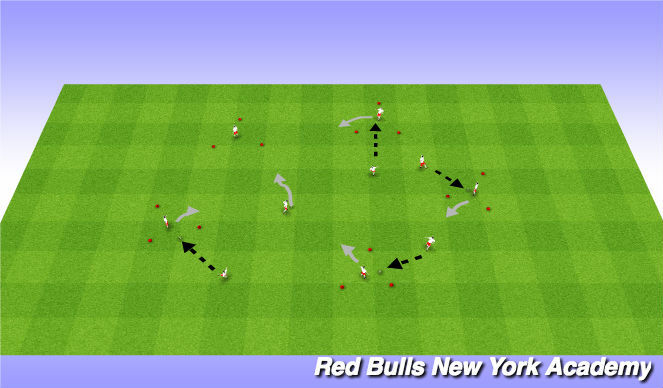 Players look to pass the ball back and forward and on the coaches command they are looking to play a 1v1 game to try and score in either goal. 3v3 Small-sided tournament games: 4 teams of 3 players each team. 2 fields of 30x40 yards with 2 Pugg Goals on opposite endlines.